The Athabascans traditionally lived in Interior Alaska, an expansive region that begins south of the Brooks Mountain Range and continues down to the Kenai Peninsula. 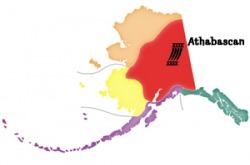 There are eleven linguistic groups of Athabascans in Alaska. Athabascan people have traditionally lived along five major river ways: the Yukon, the Tanana, the Susitna, the Kuskokwim, and the Copper river drainages. Athabascans were highly nomadic, traveling in small groups to fish, hunt and trap. Today, Athabascans live throughout Alaska and the Lower 48, returning to their home territories to harvest traditional resources. The Athabascan people call themselves ‘Dena,’ or ‘the people.’ In traditional and contemporary practices Athabascans are taught respect for all living things. The most important part of Athabascan subsistence living is sharing. All hunters are part of a kin-based network in which they are expected to follow traditional customs for sharing in the community. The Athabascans traditionally lived in small groups of 20 to 40 people that moved systematically through the resource territories. Annual summer fish camps for the entire family and winter villages served as base camps. Depending on the season and regional resources, several traditional house types were used. Traditional tools and technology reflect the resources of the regions. Traditional tools were made of stone, antlers, wood, and bone. Such tools were used to build houses, boats, snowshoes, clothing, and cooking utensils. Birch trees were used wherever they were found. The Athabascans have matrilineal system in which children belong to the mother's clan, rather than to the father's clan, with the exception of the Holikachuk and the Deg Hit'an. Clan elders made decisions concerning marriage, leadership, and trading customs. Often the core of the traditional group was a woman and her brother, and their two families. In such a combination the brother and his sister's husband often became hunting partners for life. Sometimes these hunting partnerships started when a couple married. Traditional Athabascan husbands were expected to live with the wife's family during the first year, when the new husband would work for the family and go hunting with his brothers-in-law. A central feature of traditional Athabascan life was (and still is for some) a system whereby the mother's brother takes social responsibility for training and socializing his sister's children so that the children grow up knowing their clan history and customs. Traditional clothing reflects the resources. For the most part, clothing was made of caribou and moose hide. Moose and caribou hide moccasins and boots were important parts of the wardrobe. Styles of moccasins vary depending on conditions. Both men and women are adept at sewing, although women traditionally did most of skin sewing. Canoes were made of birch bark, moose hide, and cottonwood. All Athabascans used sleds --with and without dogs to pull them – snowshoes and dogs as pack animals. Trade was a principle activity of Athabascan men, who formed trading partnerships with men in other communities and cultures as part of an international system of diplomacy and exchange. Traditionally, partners from other tribes were also, at times, enemies, and travelling through enemy territory was dangerous. Traditional regalia varies from region to region. Regalia may include men’s beaded jackets, dentalium shell necklaces (traditionally worn by chiefs), men and women’s beaded tunics and women’s beaded dancing boots.. 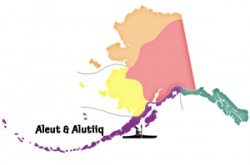 The Aleut and Alutiiq peoples are south and southwest Alaska, maritime peoples. The water is our living, whether it’s the creeks and rivers near villages, the shore outside or the vast waters of the North Pacific and Bering Sea. Knowledge of these resources and skill in harvesting them define the cycle of life in a village. The intensity of the weather that travels through our islands governs activities more than any other factor. The Aleut and Alutiiq cultures were heavily influenced by the Russians, beginning in the 18th century. The Orthodox Church is prominent in every village, Russian dishes are made using local subsistence food, and Russian words are part of common vocabulary although two languages, Unangax and Sugcestun, are our indigenous languages. The Aleut and Alutiiq people lived in numerous coastal villages as well as a few inland villages located on rivers and lakes. Each settlement had defined territories for harvesting resources such as seals, sea lions, halibut, cod, birds, plants and driftwood. The traditional houses of both cultures were semi-subterranean. The Alutiiq houses, called ciqlluaq, provided efficient protection from harsh weather conditions. For thousands of years, the house style consisted of a single room. The ulax, the basic Unangax Aleut house, is an oblong pit dwelling with wooden or whale bone frames and rafters covered by grass and sod. These dwellings were often hard to distinguish from the surrounding terrain. They were entered by means of a pole ladder through the ceiling. The kayaks of the Aleut and Alutiiqs called, respectivley, iqyax and qayaq, were distinguished from other sea craft by the split bow, which increased the seaworthiness and speed of the craft. Aleut and Alutiiq hunters wore distinctive bentwood visors with sea lion whiskers. These visors provided protection from glare as well as a visual symbol of the status of the hunter. The number of sea lion whiskers attached showed the successes in hunting. The Aleut and Alutiiq used various portions of sea mammals for clothing and other utensils. The skins of seal, sea lion, sea otter, bear, birds, squirrels, and marmots were all used for clothing items. Hats and baskets were woven from spruce roots and grass. Baskets were woven with geometric patterns, considered among the finest in the world with up to 2500 stitches per square inch. Women wove other goods: cords, cables and fish line from plant fibers and animal tissue. Still important in Aleut and Alutiiq society are kinship and family relationships. These connections persist throughout the regions and are important in the management of the village, as well as decision-making related to everyday life. Today, many Elders reminisce about the past, mentioning the strong value of sharing and helping one another in the villages of their youth. Village members would punish those who violated the rules of conduct of the village. The most serious form of punishment was banishment. Due to the wet maritime climate, it was crucial to have waterproof clothing. Therefore, the garments made of skin and gut were sewn with incredible precision making them very effective against the wet weather. Clothing was decorated with colorful natural dyes, feathers and puffin beaks, and in some cases elaborately carved ivory, bone or wooden figurines. Aleuts and Alutiit are known for their skill in building the iqyax/qayaq [baidarka]. They also used the igilax/angyaq [baidar], a large open skin boat, for travel and trade. Traveling was most often done by sea in these skin boats. However, people also walked long distances. For example, on Kodiak Island, remnants of the trails used by Alutiiq people to cross the island remain visible today. The Aleut and Alutiiq people traded among themselves as well as with others such as the Yup’ik of Bristol Bay, Dena’ina Athabascans of the Cook Inlet area, the Ahtna Athabascans of the Copper River, the Eyak and Tlingit. This trade enabled them to balance their diet as well as take advantage of foreign technology.